Fastest qualifier Tickle Ur Fancy returned to Sun Downs Sunday afternoon to win the Pot O'Gold Futurity for owner Hayden Brothers Ranch. KENNEWICK, WA�MAY 3, 2015�Fastest qualifier Tickle Ur Fancy returned Sunday afternoon to defeat Prize Pearl by three-quarters in the $30,000 Pot O'Gold Futurity at Sun Downs. For Sweet Jess was moved to the show position after Dash N Date ducked in at the start infering with the horse in the next gate causing her to be disqualified and placed ninth. Ridden by jockey Jake Samuels, Tickle Ur Fancy completed the 300 yards in :15.620 seconds to earn a 97 speed index. 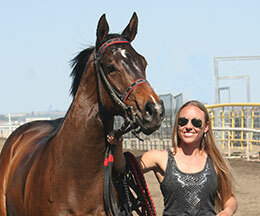 The $12,000 winner's purse boosted her career record to a perfect 2-for-2 and $12,660 in earnings. Hector Magallanes conditions the Texas-bred filly for owner Hayden Brothers Ranch. Bred by Bobby D. Cox, Tickle Ur Fancy is the second stakes winner this year for leading first crop sire DOMINYUN. Last month he sired Grade 2 West Texas Futurity winner Nucky. Tickle Ur Fancy is a royally bred filly from the multiple stakes-producing mare Sizzling Lola, by First Down Dash. The second dam is former Broodmare of the Year Sizzling Lil, the dam of Champions Corona Kool and Corona Chick; and she is the granddam of All American Futurity winner Corona Cash; leading living sire of money earners Corona Cartel; Grade 1 sire Valiant Hero, etc. Monty Arrossa saddled Prize Pearl for owners Denny and Sandy Weight. The filly is a half-sister to 2014 Black Gold Championship(RG3) winner First Prize Dive. Bred in Oklahoma by Weetona Stanley, Prize Pearl earned $5,100 for the effort. Nikeela Black had the riding assignment. For Sweet Jess is an Arizona-bred also trained by Hector Magallanes. The gray colt is owned by Ruben Magallanes. Jose Figueroa rode the $6,200 Los Alamitos Equine Mixed Sale graduate bred by K & R Allred Ranch, LLC. For Sweet Jess earned $3,600 for the effort. Completing the official order of finish were Ez Feisty Patriot, Jazzing Nibbler, First Prize Chicks, Shez Sneakin Fast, Fnf Bad Kitty, Date N Dash and Head Turnin Okey. Editor's note: A photo of this race will be posted when it becomes available from the track photographer.